More than 49 million Americans live in areas where they have little or no access to dental care, according to the U.S. Department of Health and Human Services. Enter a new concept: Virtudent, the brainchild of Hitesh Tolani, DG13, is a company that would use virtual dental visits to serve those in the so-called dental deserts. Virtudent is gaining traction from strategic partners and moving forward to secure seed investments, Tolani says. He and his colleagues, Yue Wu, a business school graduate, and Shant Hagopian, a law student, took third place—and a $3,500 prize to grow the business—in the Tufts 100K New Ventures Competition last spring. The Tufts 100K also helped Virtudent prepare for Harvard’s President’s Challenge, in which Virtudent was a runner-up, competing against 130 teams and taking home $15,000. The fledgling company has incubator space in the Harvard Business School’s Innovation Lab. Tolani and his team are also working with the Harvard School of Dental Medicine to develop best practices in teledentistry and launch a pilot program. Telemedicine, Tolani says, has been used since the 1920s, when standard phone lines connected doctors to patients in rural areas. 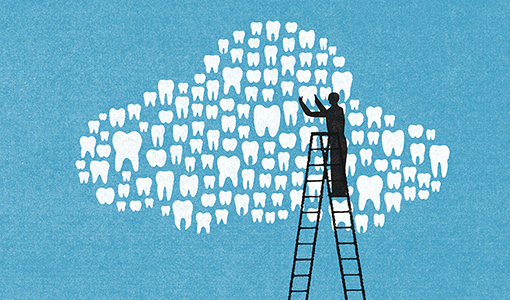 Today, X-rays, facial images, 3-D cranial models and other information can be uploaded to remote storage areas (“the cloud”), allowing an off-site dentist to diagnose a patient’s condition and develop a treatment plan. Virtudent would then refer a patient to nearby dentists who know exactly what treatments are needed. Is there a link between secondhand smoke and cavities?